Wow! Where has all the time gone? I can’t believe the last time I posted was over a year ago. I guess when you move and start a new job your cupcaking takes a back seat… Well, at least the blogging about my cupcaking took a back seat. I have continued to bake here and there, but I haven’t been good about taking pictures or posting. I am hoping to change that his summer. Even though I will be teaching two classes and trying to get a ton of writing and prep work done for projects this fall, I hope to get back into blogging… Even if it is just some quick pictures. Thanks to everyone who chimed in on Facebook or Twitter about some good new books to bake and blog with. I couldn’t make up my mind and I bought three: Dorie Greenspan’s Baking: From My Home to Yours , Flo Baker’s The Simple Art of Perfect Baking, and Warren Brown’s United Cakes of America: Recipes Celebrating Every State. I thought since I have lived in quite a few states it might be fun to cook through the places I’ve lived… although, not being a coconut fan could be a problem :-) If anybody has any requests please do send them along! Anyway, over the last few weeks I have baked a few different things for various end of the year or beginning of the summer gatherings, so I figured I’d at least share one of those in this post. 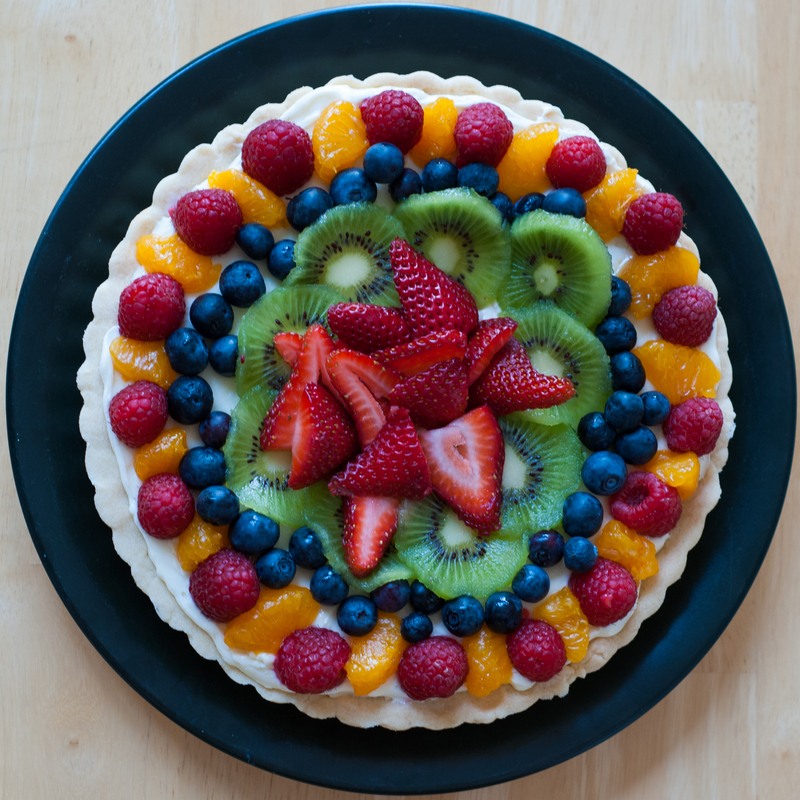 I recently converted my very popular White Chocolate Tart into a bite-size version by using little store-bought made fillo dough shells. This went over pretty well. Here are the before and after pics. Hopefully I will be speaking to you all again soon. I’m hoping not to make it another year before I post again! So, I wanted to try something different this time around – not regular sized pies or not cupcakes. So, I made Pi”e” Pops. I found a recipe for doing them completely from scratch, but opted to buy a pie pop machine. It it was only $12 and was well worth it! I made the ones we are holding first – apple pie pops and piped the digits using candy melts. It took quite a while to pipe all those digits, so when I made the second batch using bits of toffee and a pinch of salt (which I don’t have pictures of) I opted to just use an edible marker for the digits. To be honest, the candy melts looked way better, despite the time it took. I figured these weren’t going to be that easy to transport as is so I decided to wrap them up a bit and attach a little gift tag. First we took the group picture. After that we of course listened to Lose Yourself in the Digits. If you haven’t heard this, you need to check it out! Then it was time to find Pi! We engaged in a sequence of activities I combined from The Interactive Mathematics Program, called Discovering Pi. Each group had different polygons – square, hexagon, octagon, etc… and were asked to circumscribe a circle and use the polygon to estimate the circumference and area of the circle. We then used a spreadsheet to look at what would happen as we increased the number of sides of our polygon. Oh yeah, and then we ate our pi pops! Thanks to all of my students for letting me post these pics and for indulging in our Pi Day shenanigans! Wishing everyone a VERY Happy Pi Day! Warning… this post might be a little long. Don’t worry! I won’t be offended if you just look at the pretty pictures :-) I almost didn’t post these, mostly because I didn’t actually take any photos of these… I guess that is because I have posted them a few times already. These are yet another variation on the ones I made a few years ago and have continued to make for my graduate and undergraduate friends and colleagues at MSU. Anyway, then I started thinking about how these might be my last batch of MSU graduation cupcakes since we are leaving this summer. So, I thought it might be nice to do a little reminiscing. The cupcakes above I made for my TE 408 class this year. Thanks to Emily for sharing the photo she took of them. I think she took this with Instagram. I haven’t gotten into that much, but I love how you can create such cool pictures with it. My students graduated this semester and most of them are going to be doing their intern teaching (student teaching) next year. I am so excited for them! They are going to be such great teachers. Here we all are on the last day of class (minus one student who was honored at graduation and so had to go to practice) when we ate that cupcakes above. It was a nice day out, but boy was it windy. You can see this in our picture. Thanks to Kelly for sending me the picture and to the student who took it for us. Right after we took this, I was honored with some gifts from my students. How nice… I am totally going to have these in my office at UNL. Look at the beautiful mathematical inscriptions on those pots. Awesome! And each of the letters of MATH are individual plates that can be hung. On the other side my students left little messages. How cute! And if you aren’t sick enough already, here are some of my students and the other section together before we left for the Math Midway in Dayton, OH. It is part of the travelling exhibit for the Museum of Math that is located in NYC. We had such a great time! 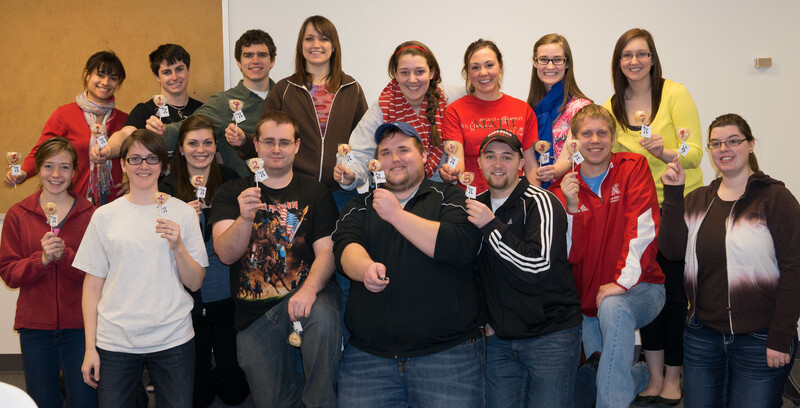 Such a good-looking group of future math teachers – I just had to post this! but also to one of the very first cupcakes I made that started this whole obsession and this blog soon thereafter. It was these Iterated Cupcakes that I made for my advisor and the PI of the research project I worked on my entire time at MSU. The project is focused on analyzing spatial measurement content in curriculum materials and so what better way to celebrate his birthday, but with a ruler-adorned cupcake. It was also one of my very first experiences with fondant. Just for a moment pretend with me that is March 14. Okay… maybe we don’t want to go all the way back to March. As promised in my last post, I figured I should post the cupcakes I made for Pi Day. At that time our web server was on the fritz. It was impossible to get anything posted. We ended up having to switch servers. Anyway, I didn’t take many pictures of these ones, but I had to post the few I did take because I think they were pretty cute. Another shout-out has to go to my friend Aaron B who bought me the book that I got this idea from. You can find this cupcake and other cute ones in the book What’s New, Cupcake? I’ve only tried a few of the cupcakes from this book. You can see the apple cupcakes here. That was my first attempt. As will be the case with many of my posts before we switched servers, you may see some funky type. Not sure what happened there. Anyway, when I was thinking about what I might want to make for Pi Day I remembered seeing these “Bake Sale Cupcakes” that looked like little pies. Since I was teaching a secondary methods course I decided to bring these to class. We didn’t have class on Pi Day so I brought them in the day before. I used my cream cheese icing rather than store-bought like the recipe asks for. To get that pie crust look I mixed in (like the recipe says) some yellow food coloring and a little bit of cocoa. What a great idea! I decided to use cherry Jelly Belly jelly beans for the pie filling since that is what I could find easily in bulk. It wouldn’t be Pi Day without the digits of Pi inserted into each cupcake with a little Happy Pi Day from the PhDcupcaker. Sorry for my long absence. It looks like my last post was in March! I didn’t even post my Pi”e” Day cupcakes. We had a bit of an issue with our hosting service and so things piled up a bit and I never caught up. You might see a better late then never Pi”e” Day post soon as well. Anyway, it is about that time of the year – Yep, that’s right… time to make cupcakes for Josh’s calculus class. The AP exam was last week and I just got around to it. I think I have done this for the past few years (not always around AP time though). Once I made them these e^x cupcakes right around when they were learning about the derivative of e^x. Then one of Josh’s students created this cool image of “the rate of tummy expansion.” This time, I wanted to do something that had to do with their school colors and mascot. So, I attempted to make little bulldog paw print toppers. Of course I started with a chocolate cupcake. I usually like to put chocolate chunks inside, but since I didn’t have any I used some white chocolate chips. I always use my siganture cream cheese icing. I really like this much better than buttercream. For the toppers I toyed around with using fondant, but I didn’t want to use the pre-made fondant because it just doesn’t taste very good. I had one failed attempt at making some marshmallow fondant with this recipe here that my friend Aaron shared with me some time ago. I think my marshmallows may have been too old… Oh well. I will try that again at some point. So, I went back to one of my orginal ideas which was to use Wilton Candy Melts kind of like you would with cookie dough and cut out little circles. The school colors are red and blue. 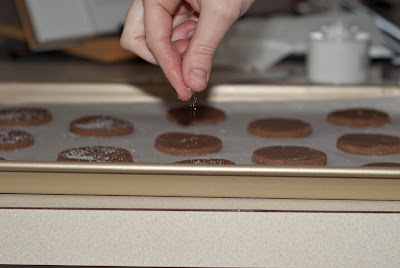 So, first I melted some red candy melts and spread the melted candy on a parchment-lined cookie sheet. I placed this in the fridge for about 5 minutes and then took it out and used a round cookie cutter to cut all my little circles. I had debated on whether I should use candy melts for the actual paw print. I thought I would and I even picked up these Wilton Candy Decorating Pens, but in the end I thought that royal icing might work a little better. I might not have got the pens to the right workable consistency though. I will beed to try them again. So, I made a batch of royal icing and tinted it blue using this recipe. I wasn’t thinking, and so I made a whole batch – Anybody need any royal icing? :-) I then went to work on trying to get the paw prints on the red circles. I was pretty happy with the way these came out. I was trying to get them so that they didn’t have those little peaks where I lifted up the piping bag, but as you can see I wasn’t all that successful. I read somewhere that this might be because my icing was still too thick. I didn’t have the same problem when I made my cupcake cookies, but I was filling in a much larger area. Anyway, it wasn’t too big of a deal. Only thing left to do was assemble the cupcakes – a dollop of cream cheese icing and one Bulldog topper. I wasn’t sure if the color from the candy melts was going to run or anything. So, I decided after putting the toppers on the first half to leave the second half iced, but without the topper. Josh assembled the rest when he got to school. It looks like his class enjoyed them! Congrats on finishing up a year of calculus! Go Bulldogs! We have been having some technical difficulties that resulted in a change in hosting companies, so this post has been sitting around waiting for us to get up and running again. Yep… you read that right Cupcake Cookies. Not cupcakes… although I do have to make cupcakes soon… it has been way to long. 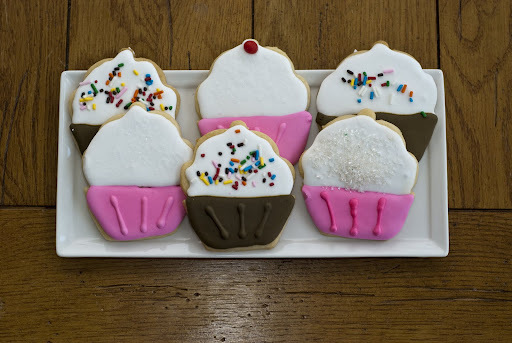 Anyway, I have been wanting to make some royal iced cookies for a while and when we were in Chicago in January we went into Crate and Barrel and I found these cute cupcake cookie cutters for under $3.00! I had to have them! I thought these wereÂ perfectÂ for making some royal-iced cookies. So, fast forward 2 months later and finally… since it was my mom’s birthday I thought I would make some cookies and send them to her. 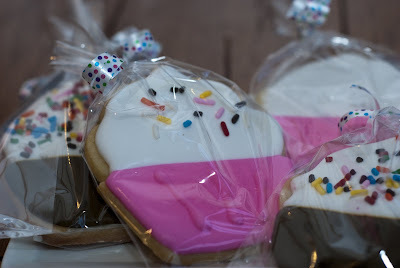 Â One of the sites I really enjoy for all things royal-iced cookie is Sweetopia! I used a sugar cookie recipe from the site and the royal icing recipe that they recommend, which isÂ originallyÂ from antonia74. 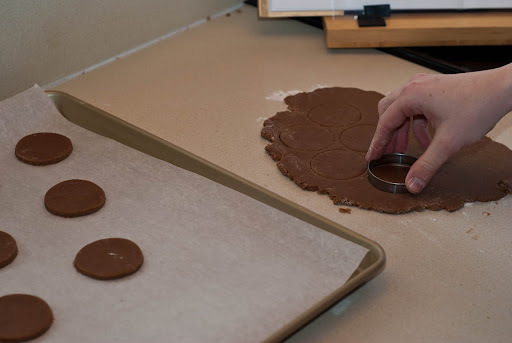 Even though the sugar cookie doughÂ recipeÂ contains baking powder, Marion suggests not using any baking powder so the cookies don’t spread when they bake. I left it out and I was pretty happy with how my cookies came out (and tasted!) so I will never include baking powder in my sugar cookies. I also placed the cut-outs in the frdige for a while before placing them in the oven and I think that helps as well! I made one batch of royal icing. I wasn’t sure if this would be enough, but I figured I could always make a second batch if I needed to. 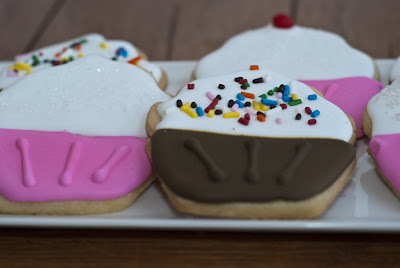 I figured I’d do the icing part of my cupcake cookie in white since I usually ice myÂ cupcakesÂ with cream cheese icing and then I would die the rest of the royal icing pink and brown. Not sure why I decided on pink, but I wanted an additional color and I think I had seen it on cookies similar to these somewhere and thought it looked good. I’m glad I only made one batch of icing because it was more than enough. I didn’t do anything too fancy. I did pipe some lines on the liner part of the cupcake after the main flooded section had dried, but that was the extent of my fanciness on these. 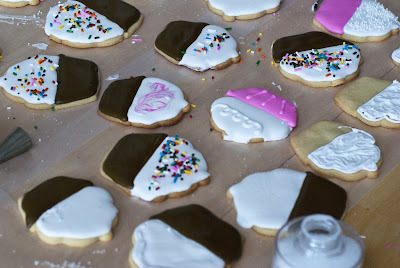 I also sprinkled a variety of sugars and sprinkles on the white “icing.” Once again, sweetopia has some great tutorials on decorating with royal icing. I followed the direction there and didn’t use two different icing consistencies. I used the same icing for piping my outing and for flooding the inside. It made it much easier than trying to worry about having two consistenciesÂ of each color. That would have taken forever! I used a Wilton #3 tip for the piping and the flooding. All in all, I think these came out pretty good. I was pretty happy with them. Once thing I am not good at though (and don’t know if I ever will be) if keeping my work area (or myself) very clean while working. I really want to get better at this. 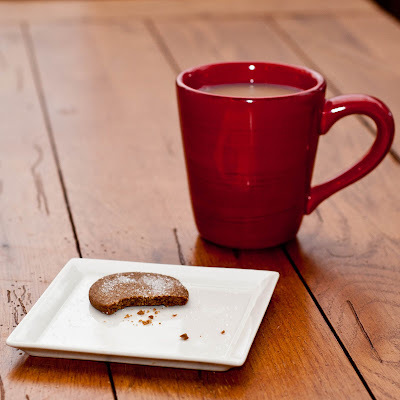 I feel like things get so messy and there is so much to clean up that when I am all done I sort of regret the whole processÂ becauseÂ it takes me just as long to clean as it did to make all the cookies! 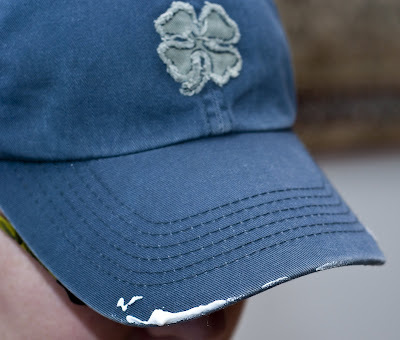 :-( This time around I even ended up with royal icing on my lucky hat. I suppose maybe that makes it even luckier. Luckily I was able to clean my lucky hat without to much trouble. I then decided to package up my cookies. Not only was I goign to send them to my mom, it was also a freind’s birthday and a few of us had a plan to go to a movie. So, I figure I would bring along some birthday cookies. I packed them up and secured them with some curling ribbon. When I talked to my mom she said that they made it to NY okay. They didn’t break too much. We had a few of them around for a few days and I actually think they actually tasted better as the days went on. I thougth they might start getting stale, but to myÂ surpriseÂ they didn’t. I Â will definitely make cookies like this again. I was thinking I might do some shamrocks for St. Patrick’s Day, but I’m not sure if I will have time…. Next week is a little busy since it is the first week back after Spring Break and I am leaving for a conference on Friday. So, we’ll see. Ahh… Nutella….. myÂ alternativeÂ to peanut butter. Â Although I do like peanut butter with chocolate, I have never been a huge fan. I do like peanuts, but didn’t grow up on peanut butter and jelly like a lot of kids. In the last few years though I have become a fan of Nutella! Although I don’t find myself eating it too much, I am a big fan! Josh seems to think it is weird… not sure why… I kind of see it like peanut butter (which he really likes). I just think he likes to give me a hard time! 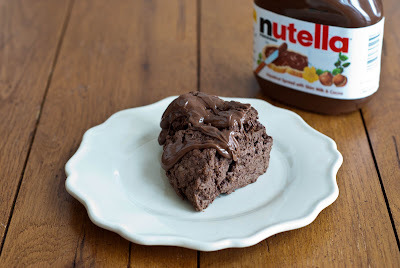 :-)Â I am so excited to be hosting the Club BAKED pic this time around – Nutella Scones and since I am the host I have posted the recipe for these which you will find at the bottom of this post. I have never made scones and so I was a little worried by all the “don’ts” in the recipe – Don’t over-knead, don’t over-bake… In the end I think these came out just right! First step was to mix all the dry ingredients. I decided to try a new cocoa powder. They suggest Valrhona, but I haven’t been able to find that around here. 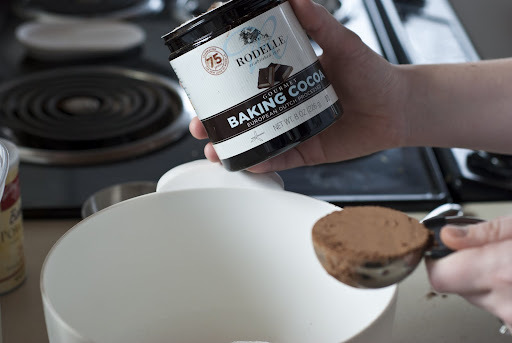 I decided to try thisÂ RodelleÂ baking cocoa. 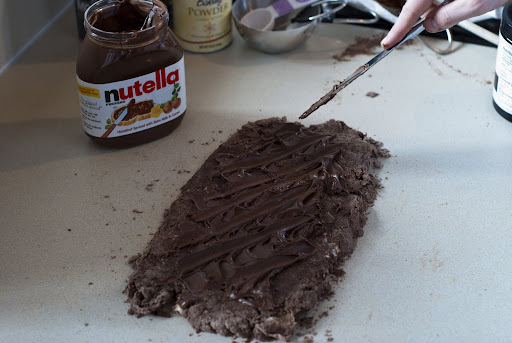 Â I whisked all the dry ingredients (flour, sugar,Â cocoa powder,Â baking powder, and salt)Â together. 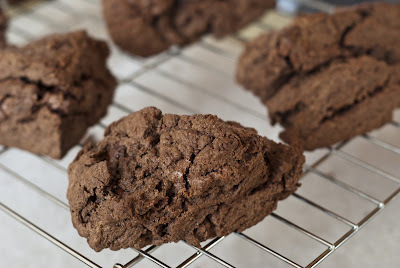 Another thing – I didn’t use unbleached flour. At least, I don’t think so because I just used whatever I had and I am pretty sure it wasn’t unbleached. I am not sure if it made a difference or not. 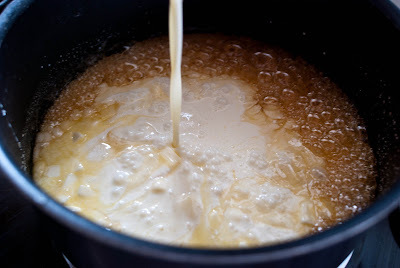 After getting the dry ingredients together I whisked my egg and heavy cream and then added that to the dry mix. I mixed that until just combined and then it was time toÂ Â add the butter. I had already cut the butter into cubes and it was waiting for me in theÂ fridge. Once I got that in there I tried the best I could to use my fingertips to get the butter into the flourÂ formingÂ pea-sized bits. I think it was prettyÂ coarseÂ when I moved onto the next step, but I am wondering if it was a little too grainy still. I had a hard time getting it to stick together, as you can see in the next picture… lots of dough crumbs! Â It took a little work, but I finally got it shaped into a 6 by 12 in. and started spreading my Nutella on! Yum! Then it was time to roll. I was worried the whole thing was just going to crumble, but it wasn’t too bad. I did it pretty slow and it actually rolled up pretty easily. As you can see I did leave a little trail of crumbs, but for the most part things came together well. Up the little cylinder went so that it could then be smushed back down into a 1 3/4 in high disk. Here , we were reminded not to overwork the dough! I think I was definitely stressing about making sure to not overwork the dough. I then decided to use my pizza cutter to cut the wedges. I was only able to get 6. I probably made them a tad bigger than they needed to be though because they are pretty dense. Once I had these cut I put them on my parchment lined cookie sheet. 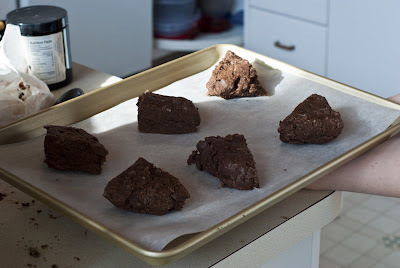 I baked them for 18 minutes – after 9 minutes IÂ rotatedÂ the cookie sheet. Once the time was up I checked and thought they could use a few more minutes so I put them back in for two more minutes before taking them out. Not too bad, if I do say so myself…I thought they actually looked like scones! Yay! I let them coolÂ completelyÂ like the directions said. Once I went back to check out the next part I noticed that it said to put the microwaved Nutella on hot scones. So, I am not sure if I was supposed to let them cool or not. I think it was fine. I poured the Nutella on and let them set in the fridge for about 5 minutes. Here’s the one I decided to eat. I was actuallyÂ surprisedÂ that it wasn’t too hard. I guess I thought it would be rather crunchy for some reason. I think the only scones I have ever had might have been sitting in the coffee shop for a little bit too long. These were actually a bit soft, but I am not sure they had the flaky texture I have heard scones described as having. I also think I would have liked them to be a bit sweeter. Maybe more Nutella… the Nutella on top definitely helped! That said, these were good in the morning with a cup of tea and in the afternoon with a cup of hot chocolate. I put the ones we didn’t eat into an airtight container and ended up having one in the morning the next day. I actually think I liked them even better on day 2! Thanks everyone for baking along with me! 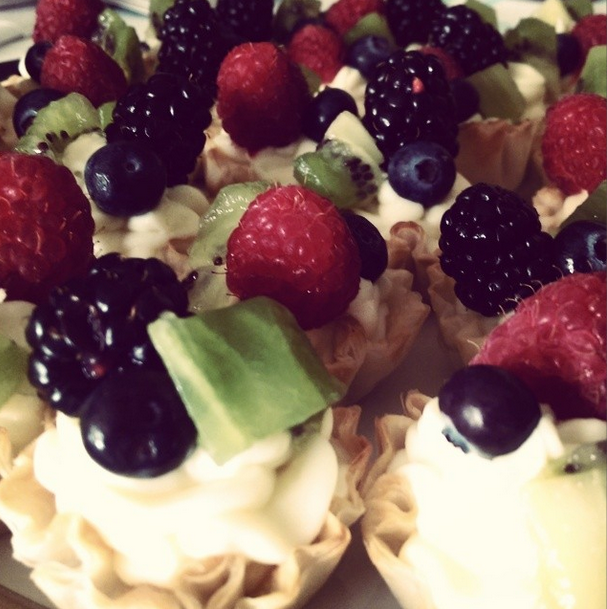 To see all the blog posts go over to Club: BAKEDÂ and to bake your own follow the recipe below! 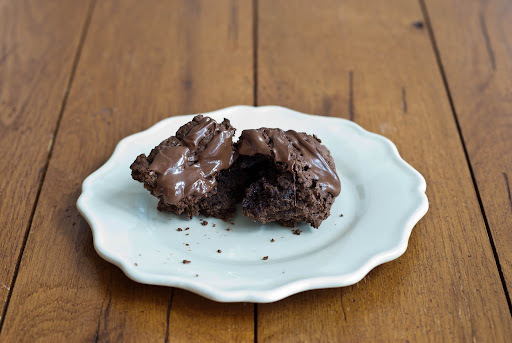 Next up on the Club: BAKED docket – Mississippi Mud Pie (B) hosted by Alexis. Matt & Renato’s advice: Do Not Knead Too Much. Stop working the dough the minute it comes together and don’t worry if there are a few dry bits scattered throughout. Preheat the oven to 375 degrees F and place the rack in the center. Line a baking sheet with parchment paper. 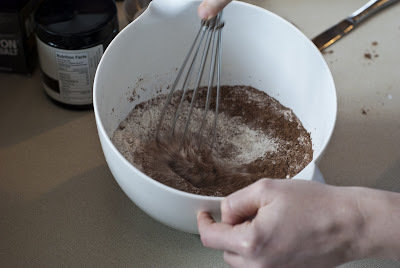 In a large bowl, whisk the flour, sugar, cocoa powder, baking powder, and salt until combined. Add the butter. 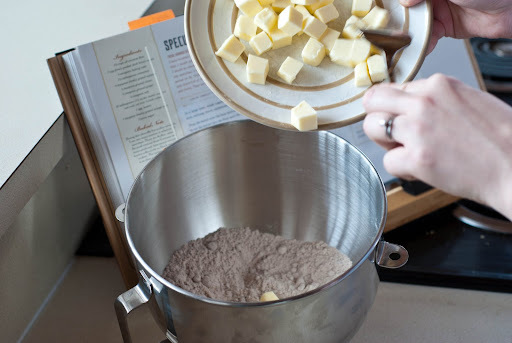 Use your fingertips to rub it into the flour until the butter is pea size and the mixture is coarse. 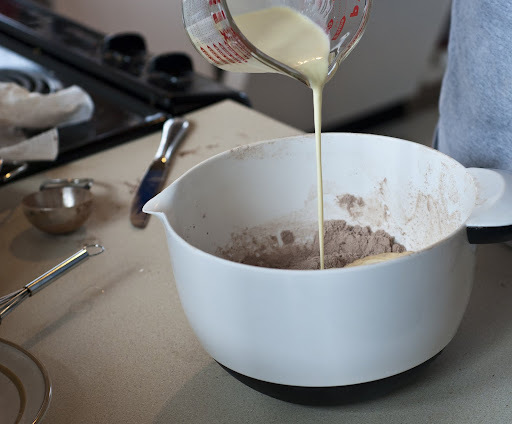 In a separate bowl, whisk together the egg and cream.Â Slowly pour the wet ingredients into the dry ingredients and stir until the dough just comes together. 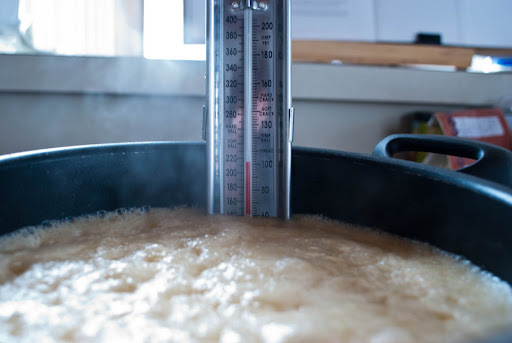 Gently and briefly knead the dough with your hands.Â Add the toasted hazelnuts and knead gently to incorporate.Â Flatten the dough into a rectangle approximately 6 by 12 inches. 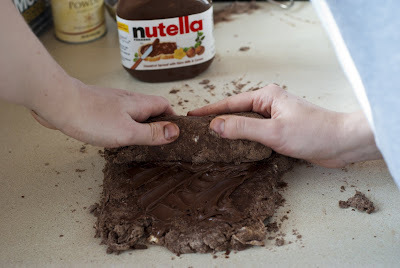 ( it doesn’t need to precise) and spread 1/4 cup of the Nutella on top in a criss cross pattern.Â Roll the dough up to make a cylinder about 6 inches long, turn it on its end, and gently flatten it into a disk about 1 3/4 inches high. Do not overwork the dough. Cut the dough into 6 or 8 wedges and place them on the prepared baking sheet.Â Bake the scones for 18-20 minutes, rotating the baking sheet halfway through, or until a toothpick inserted into the center of a scone comes out clean. Do not overbake. Transfer the scones to a wire rack to cool completely. Place the baking sheet with the parchment still on it underneath the rack. 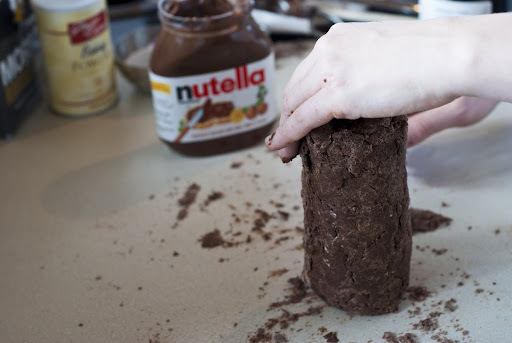 Heat the remaining 1/4 cup Nutella in a microwave until pourable, about 10 seconds on high. Pierce the tops of the scones a few times with a fork. Use a spoon ( or two spoons-one to scoop, one to scrape) to drip the warm Nutella in a zigzag pattern over the tops of the hot scones. Transfer them to a refrigerator to set for 5 minutes, then serve immediately. Most scones have a lifespan of 24hours or less; however, these scones taste pretty darn good on day two provided you wrap them tightly and store them at room temperature. Okay… I know… I was supposed to post these on Feb 15. I actually made them before that. I even asked Josh to upload the pictures so that I could post before the Feb 15 date, but alas…. my blog post never came to fruition. 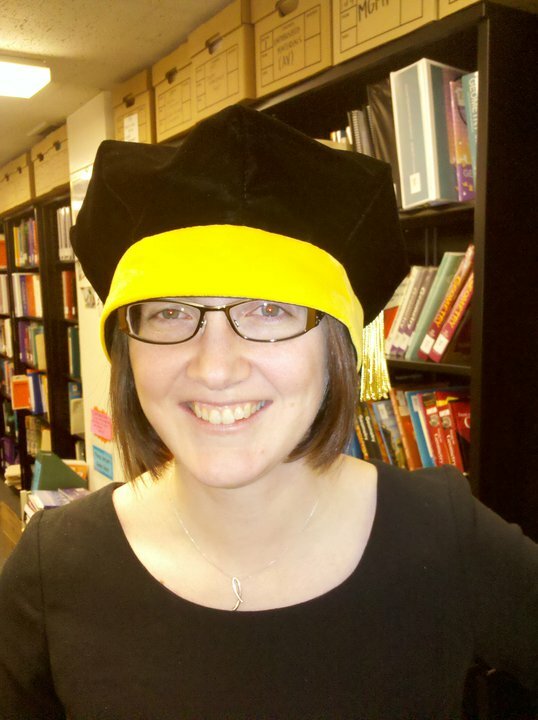 I thought that after defending my dissertation I would have all the time in the world to bake and blog. Well, that was all just a huge fantasy I suppose. Anyway, so here I am… having accomplished a fair bit of schoolwork and housework, so I figured even though it is way late, I should post about thoseÂ deliciousÂ caramels. Caramel has been my flavor ofÂ choiceÂ lately – I love anything caramel,Â particularlyÂ salted caramel. One of my favorite cupcakes of all time were those Martha Stewart Chocolate SaltedÂ CaramelÂ Mini Cupcakes and I love that super rich Sallted Caramel Chocolate Layer CakeÂ that I have made three times, despite it’s difficulty! 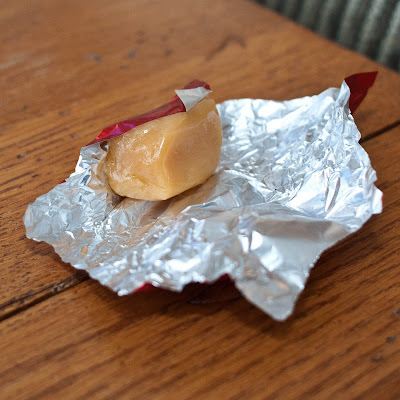 So, when it came to making these soft candy caramels I was definitely in! What a great pic by by Teri of The Freshman Cook! I have made caramels before, but for some reason I always seem to have a hard time cutting them and usually completely give up, despite having gone through all the work of actually making them. This recipe was completely different… maybe it was the soft texture, or the fact that I actually followed their directions for using some cooking spray on the knife before slicing. Whatever it was…. these were so easy to cut and wrap. These caramels had 1 cup of light brown sugar in them. Maybe this is what made these so tasty. 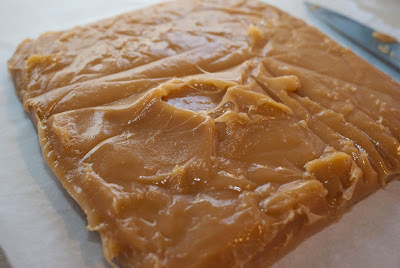 I don’t remember using brown sugar in the caramels I have made before… maybe I am just forgetting those disasters though! It didn’t bubble up as much as usual when I added the cream and condensed milk. I was a little worried that my thermometer wasn’t working. I haven’t had much success with recipes that required certain temperatures recently and so I have been blaming that on my thermometer, but this time… things seemed to go okay. Once it was it was back up to 250 or so I removed it, added the vanilla and salt (oh how I love the salty-sweet combo). I think I added a little more than the requested 1 tsp. It took all my will-power to resist just eating this with a spoon…. 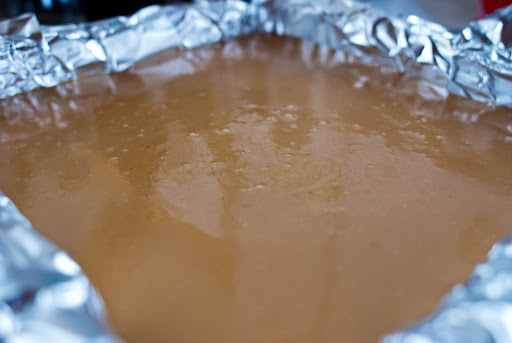 Now that I think of it, this might have been a good recipe to use for the scoopable caramel I tried to make around the holidays. A friend of mine had brought me some salted caramel from Paris. It came in a little jar with a spoon and boy was it tasty. It may have been the reason why I was actually able to finish my dissertation :-) I tried replicating it and it just did not work… this recipe might have worked though… Next time I am going to try it.. pour this right into a little jar and see if I can eat it with a spoon. Yum!!!! Anyway, the next morning I dumped the block out to cut it. 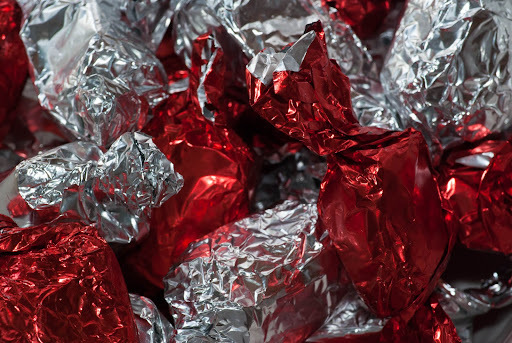 I did have a bit of a problem getting the foil off, but it wasn’t too bad. That big peak near the center was the result of sticking to the foil. It wasn’t too bad. Since it was Valentine’s Day I thought I might bring these to my class. I bought some red and silver wrappers and began cutting and wrapping. My students (and colleagues) really liked these. And of course… I loved them. This recipe is definitely a keeper! Next time I think I might try to wrap these in clear wrap so you can see the caramel goodness! This time around the BAKED Â choice was some cookies, speculaas to beÂ exact and it wasÂ co-hosted with Baked Sunday Mornings, another Â group of bakers baking through BAKED Explorations.Â I wasn’t sure if I was going to bake along this time because I wasn’t too excited about these cookies, but I figured… why not, especially since I had all of the ingredients on hand (except for the orange zest which I ended up leaving out). I do agree that these made the perfect snack to enjoy with a cup of tea. 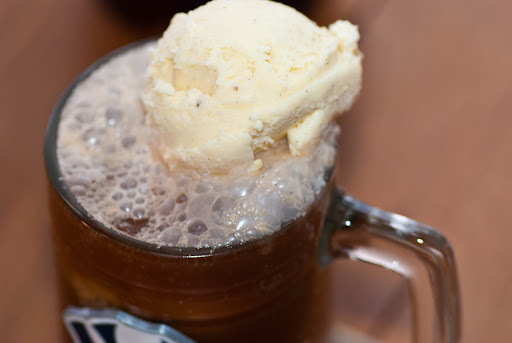 MyÂ husbandÂ and I are big tea drinkers and not only was this a great snack while I finished re-reading the Hunger GamesÂ (can’t wait for the movie! ), we were able to enjoy a few of these with our afternoon cup of NYC Breakfast yesterday.Â This recipe was super easy.Â I didn’t have a pastry cutter (should probably get one of those one day), so I just used a large fork to get all of that Â butter into my dry mix. I guess this was the hardest part. IÂ didn’t seem to matter too much. Once I got itÂ into a ball and wrapped I putÂ in the fridge for a little over 60 minutes. After that it was time to roll, literally! Â I’m not sure that these were a 1/4 in. thick as suggested. IÂ think they may have been a little on the thin side since I got more cookies than what the recipe said I would. I’ve thought about buying those cookie slats because I feel like I never get the dough the right thickness. I guess if I start making more cookies I might invest in those. I ended up just using my round cookie cutter. I think the cookies were a pretty good size. After they were on the cookie sheet I sprinkled each one with some William-Sonoma White Sanding SugarÂ . We enjoyed some of these a few minutes afterÂ taking these out of the oven. I think I actually liked them the best when they were a little warm. I have always been more of a soft, rather than hard, cookie fan. 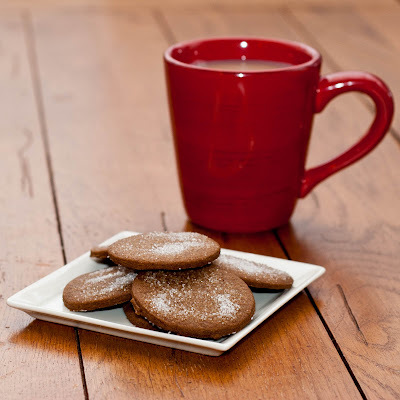 Â If you are intrigued by these speculaas and want to make them yourself, you can find the recipe here. Or, if you just want to check out the other baker’s links go to Club: BAKED! 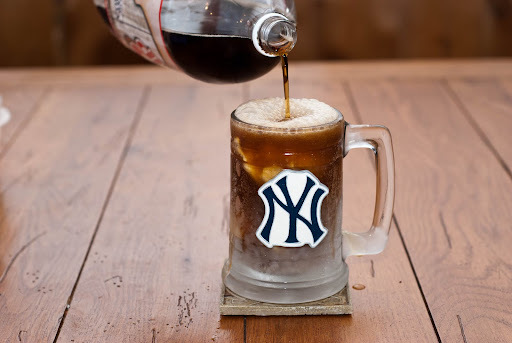 So, I thought it would only be right to drink my semi-homemade root beer float in my Yankees mug in honor of Jorge. Today Jorge Posada officially announced his retirement. 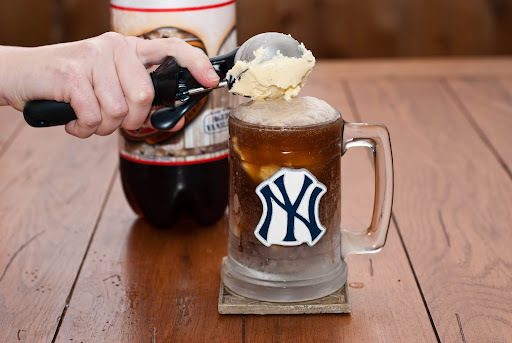 So, while his teammates and friends chose to honor him with kind words, I figuredÂ what better way than to celebrate his career than to drink my semi-homemade root beer float in the Yankees mug that I got from my friend Wendy (BTW, it was a wedding party gift and her husband is a Red Sox fans…. I’m surprised he even allowed this in their apartment!). Anyway, the other day I made some homemade vanilla ice cream for a party we had at my office. It has become somewhat of a tradition to have root beer floats and so I made a cake (a 6-layer version of the same cake I made a few months ago) and I made some homemade vanilla bean ice cream for our floats. I got the recipe right from the recipe book that came with my Cuisinart ice cream maker. I did not make the root beer, hence the “semi-homemade.” These were actually quite tasty! I love the vanilla bean (although it is somewhat expensive, Â I think it really does add to the flavor). So, here’s to Jorge! Hip-Hip-Jorge! Hip-Hip-Jorge!